Perhaps no other society in history poured as much cultural energy into textiles as indigenous Andean civilization. Galvanized by inhospitable terrain-soaring mountain ranges, impenetrable jungles, dry deserts, and cold oceans-Andean people achieved great technological accomplishment, economic prosperity, and political cohesion without written language. Textiles developed as the primary material focus of civilization, serving to embody wealth, communicate complex ideas, and conceptualize abstractions, as well as more familiar roles of personal identity in a fashion system. For Andean societies, the textile medium paralleled uses of gold, writing, mathematics, and painted art in European history. Meaning was conveyed not just in color, pattern, and style, but also through complex processes of weaving and fabric structures. The centrality of fiber art to the Andean mind resulted in a remarkable development of skills, design, and technique unmatched anywhere. Andean textile art flowered long before the sixteenth-century European invasion. Dry coastal deserts were home to third-millennium B.C.E. cotton traditions based on ingenious structural elaboration rather than color to achieve design. At the same time, mountain societies developed traditions of working colorful dyed camelid fibers. Climate conditions leave few examples of highland wool traditions until brightly colored yarns appear on the coast during the first millennium B.C.E. The fusion of the two traditions established the character and brilliance of the Andean textile tradition that has persisted into the twenty-first-century. Andean textile evidence comes from tombs in the coastal deserts with ideal preservation conditions. While opulent tombs may yield spectacular textiles, reconstruction of ordinary costume from grave goods demands care. Garments buried with important persons may reveal technical and design sophistication but not represent daily clothing. Less elaborate tombs, miniatures, and human images in tapestry or painted pottery show that a basic Andean costume existed by at least the first millennium B.C.E. and persisted until the arrival of Europeans two thousand years later. Constructed of short warp fabrics with little or no tailoring, the costume varied in pattern, layout, color, and structure to reflect cultural identity. The dry deserts of coastal Peru hold elaborate tombs filled with fabric treasures demonstrating technical and design control over the textile medium, but not necessarily reflecting daily costume. Mummy bundles from Paracas (first millennium B.C.E.) contain huge wrapping cloths, fine decorated bands, and embroideries proving a keen understanding of mathematics as well as design. Patterns on cloth found in these bundles chronicle a rich spiritual life filled with mythical beings and elaborate rituals in a highly-stratified society. Across most of the Andean area, men wore a breech-clout and a pullover shirt. The shirt extended nearly to the knee in some cultures but in others stopped at the waist, making the breechclout visible. Shirts might have a fringe at the bottom and arm openings, ornamental bindings, or other elaborate decoration that indicated social roles. A Nazca culture shirt of the late first millennium B.C.E. might be plain-woven natural-colored cotton embellished by complex wool embroidery at the neck slit, arm openings, and hem. The Middle Horizon Wari culture (500-1100 C.E.) made fine-spun alpaca tapestry shirts as symbols of rank and authority that conveyed complex patterned meanings. Men wore a mantle as an overgarment, carried a shoulder bag, and used a headdress to express cultural identity. Headdresses included hats, turbans, and braided cords wound around the heads. Elaborate tapestry shirts of Wari men were complimented by a four-sided pile or knotted hat that expressed mythological themes. The basic women's garment in pre-Colombian societies was a square cloth wrapped around the body below the arms and pinned or stitched above the shoulders. The dress reached below the knee and may have had plain color or more elaborate patterned stripes worn horizontally. Many cultures added a patterned belt. For cultures like Nazca, large shoulder pins were part of the fashion statement. Over the dress, Andean women wore a square or rectangular shawl around the shoulders and pinned at the breast. Highly visible shawls often had complex patterning in tapestry, embroidery, or warp-faced techniques. Like men, women wore culturally specific headdresses, such as woven headbands or head cloths that fell down the shoulders and back. Hair, generally worn long and loose, or in multibraided styles, also figured in statements of fashion and identity. At the time of the sixteenth-century European invasion, the Inca Empire spanned highland and coastal Andes from present-day Colombia to Chile and united many ethnic and language groups into a single political and economic structure. Local costume from the basic Andean style of shirts and mantles, dresses and shawls, was preserved as an indicator of ethnic identity, useful in administration of the sprawling Inca enterprise. Evidence for Inca costume includes burials, figurines, and painted images found in earlier times, but also writings, line drawings, and portraits by early European visitors. 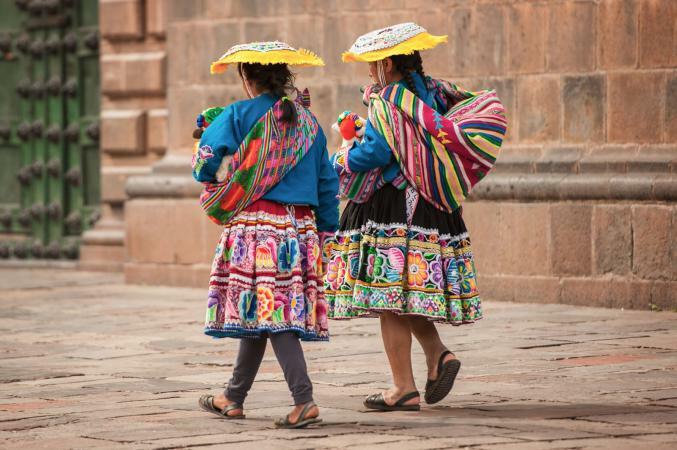 Inca use of cloth may provide a good model for understanding costume and fashion in earlier Andean cultures. Two modes of production characterized Inca textiles. Qompi was fine camelid cloth, mostly of tapestry, produced with state support by cloistered women or men. They worked on an unusual frame loom at least twice as wide as it was tall. The fabrics were folded in the middle to become men's shirts that were distributed by the government as uniforms or rewards for state service. Large checkerboard patterns and other repeating designs indicated social or military roles, while more elaborate registered patterns called tokapu may have functioned within a still obscure system of communication. Tokapu blocks are also found on belts used by both Inca men and women. Awasqa, a second mode of textile production made in the rural villages, was warp-faced cloth with complex patterns made from two oppositely colored warps in a technique known as complimentary warp weaving. Some Awasqa was tax payment to the state, but most local style cloth stayed within the village-specific fashion system. People of all ranks within the Inca Empire probably wore the same essential costume of shirts, breechclouts, and mantles for men and wraparound dresses and shawls for women, with marked differences in quality to indicate class or identity. Finely spun and brightly colored cloth reserved for the Inca nobility was called silk by the Spanish because such smooth, lustrous, and fine-to-the-touch fabric was only known in Europe from Chinese cloth. These fabrics became shirts that reached to the knee and were sometimes belted over a breechclout with a relatively plain mantle as outergarment. Inca men wore very short hair, and the upper classes used large earplugs that stretched the lobes. Men's headdress was rigidly controlled; higher classes wrapped ornate braided strands around their heads. Inca-period women's dress often had broad horizontal stripes and reached the ground, held at the waist with a highly patterned belt. The shawl pinned in front usually had more elaborate patterning in bands of complementary warp or weft weaves. Women's hair was loose or in two braids, and held by a patterned head-band or covered with a cloth. Wrapped in striped and patterned cloth, Inca nobility must have made a very colorful sight indeed. People of lower status wore the same garment types, but they were constructed of coarser natural-colored yarns with less patterning laid out in village-specific formats. The European invasion of the sixteenth century altered costume drastically, and introduced new materials such as sheep's wool and silk, as well as new ideas and forms. In less than a hundred years, Andean men adopted European breeches, hose, and felt hats. The Inca tapestry shirt became ritual costume used to claim royal descent, and specific meaning of patterns was lost. Portraits of Inca noblewomen show fuller, ground-length Inca-style dresses. Decorated belts define the waist, and highly patterned shawls cover the shoulders. Common people of the Andes continued to use much of the basic costume but added pants for men and hats in the new European technique of knitting. Spanish Peru, a closed colony until the eighteenth century, developed a unique Creole costume from European, Islamic, and indigenous sources. In addition to the long full skirts and lace trim familiar in Europe, Spanish Creole women added the manta, a small hood that could cover the face in the manner of the Islamic Moors, and the saya, a long straight overskirt from indigenous Andean models. The Limeña Tapada (Covered Woman of Lima) of the seventeenth century wore long skirts to obscure the feet, while tight bodices went so far as to reveal the breasts in public. The eighteenth-century advent of the Bourbon Kings in Spain and political ferment in Peru led to profound changes in the clothing and fashion. With the colony opened to trade, Creole costume fell into step with European fashion. Meanwhile, leaders claiming Inca royal descent revitalized indigenous costume as part of rebellion against Spanish authorities. Insurrections led to prohibition against indigenous costume and to sumptuary laws requiring Andeans to adopt a new costume derived from that of Iberian commoners. This set of clothes included vests, jackets, and knee-length breeches for men and full skirts for women. Both genders adopted a saucer-shaped hat made of felt over an armature of coiled basketry. Widespread throughout the Peruvian Andes by the beginning of the nineteenth century, these costumes were precursors of the twenty-first century's traditional Andean costume. The multicultural Andes in 2004 encompasses parts of Ecuador, Peru, Bolivia, Chile, and Argentina, where nearly 30 million people speak indigenous languages. Millions more without language identity still live fundamentally Andean lives, with cultural identities reflected through widely-differing costume. Many use style flexibly, changing costume to express different aspects of the multiple identities that are their heritage. The most elaborately-patterned handwoven Andean cloth is made in rural villages from Cuzco south through Bolivia. 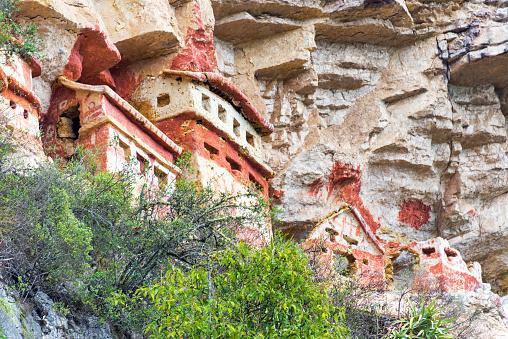 Each village has a distinctive costume derived from fusion of Iberian and indigenous Andean models. Many village women wear full skirts of balanced, plain-weave, woolen cloth known as bayeta, white cotton blouses and vests with machine embroidery, and felt or bayeta jackets. Village-specific felt-covered basket hats and decorated warp-faced shawls indicate identity. Some Bolivian women use a patterned straight aksu overskirt derived from the original Andean dress. The distinctive costumes of women who leave village identity behind to live in major highland cities, use manufactured goods to declare participation in the money economy and class, rather than village identity. Knee-length pleated skirts with machine-made sweaters and blouses mimic but are not confused with rural costume. Women wear shoes and hose rolled at the knee, and cover their shoulders with machine-made shawls. High-crowned white straw hats are the most distinctive feature of the area-wide costume worn by women of commerce. Highland men may own village-specific clothes for special occasions, but usually wear an area-wide costume to indicate class rather than village identity. Most costume elements are store bought, such as pants and shirts, although men use a poncho handmade by women in their lives. In the twentieth century throughout most of Peru and Bolivia, this poncho was walnut-dyed brown without pattern, but red ponchos with supplementary warp-woven patterns have more recently become popular with university-educated men. Brown ponchos are usually worn with a felt fedora, while red-poncho men prefer to go hatless with a neck scarf in very cold conditions. The northern Andes of Ecuador has very different costumes, mostly made by specialists from machine-made cloth. Women wear dark wraparound skirts at the knee or below and cotton lace blouses topped with voluminous bead necklaces. Felt fedoras crown the head. Men wear shirts and pants of white cotton covered with a machine-made or handmade poncho that may be reversible or even have a collar but has little patterning. The belt that both sexes wrap around the waist may be the last remaining handwoven costume item. Fabric originally manufactured in Spain that was widely used in South America in the Colonial period. Made from cotton or wool fiber, it was loosely woven from softly twisted yarns that were brushed up on the surface. In order to make the fabric more compact and dense it was subjected to a special finishing process. A pattern in which an additional set of lengthwise (warp) yarns is used in the same way as the primary set of warp yarns. Emery (The Primary Structures of Fabrics, 1980) describes such warps as "co-equal." Crosswise yarns in a woven fabric. Synonyms include filling and woof. Fabric in which the crosswise (weft) yarns predominate on the surface of the fabric. The arrival of the money economy, tourism, and the information age has brought great change to traditional Andean costume. While some villages adhere to traditional productive patterns and costume norms, even rural people adopt conventional store-bought clothes as they enter the money economy. Many discover the warmth and convenience of down coats and other garments left by hikers and tourists. With even the most remote villages now within reach of television, many women abandon braided hairstyles of previous generations and adopt jogging suits and other casual dress. For thousands of years, technology of cloth production and use has been both a visible fashion statement and the primary mode of intellectual exploration. Recent changes challenge the fundamental identity of Andean people, whose culture was built on cloth. See also South America: History of Dress. Adelson, Laurie and Bruce Takami. Weaving Traditions of Highland Bolivia. Los Angeles: Craft and Folk Art Museum, 1979. 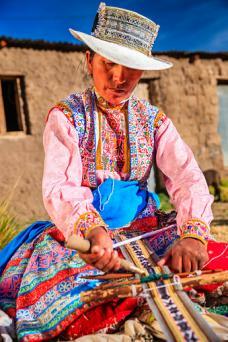 Excellent photos of village specific cloth and costume from Bolivia. Guaman Poma de Ayala, Felipe. Nueva Corónica y Buen Gobierno. Paris: Université de Paris, Travaux et Mémoires de l'Institut d'Ethnologie XXIII, 1936. Over a thousand drawings of Inca life, costume, and history sent to the King of Spain in 1615. Murra, John V. "Cloth and Its Function in the Inca State." American Anthropologist 64, no. 4 (August 1962): 710-728. A fundamental account of the expanded use of cloth by Andean society. Paul, Anne. Paracas Ritual Attire. Norman: University of Oklahoma Press, 1990. An excellent analysis of textiles and costume found in sumptuous burials from the Paracas peninsula. Rowe, Ann Pollard, ed. "Nazca Figurines and Costume." Textile Museum Journal 29 and 30 (1991): 93-128. An excellent reconstruction of costume in ancient Peru. --. "Inca Weaving and Costume." Textile Museum Journal 34 and 35 (1996): 5-53. An authoritative account of what people looked like during the Inca period. --. Costume and Identity in Highland Ecuador. Seattle: University of Washington Press, 1998. An excellent and comprehensive examination of the costume used in the many cultural areas of Ecuador at the end of the twentieth century. Rowe, Ann Pollard, and John Cohen. 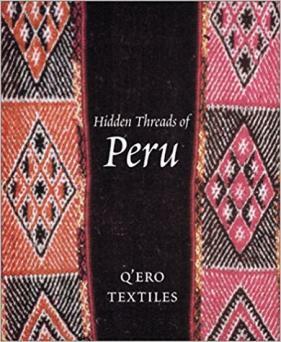 Hidden Threads of Peru: Q'ero Textiles. London: Merrell, 2002. An exceptional view of cloth and culture in a contemporary Andean community.